Mon. Thurs. nights: 7-9 p.m.
Friday & Saturday nights: 7-11p.m. *hours may vary by season please call for programming information. Community Center usage by outside groups – The Community Center is available to interested outside groups for meetings, activities, etc. on a first come, first serve basis. 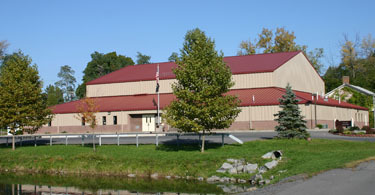 Groups such as Seneca ARC, Boy Scouts, Girl Scouts, Little League, Vince Lombardi Football, and the Red Cross Star Organization, have used the Community Center in the past for various activities. from 7:30 a.m.- 8:30 a.m.
Pickleball – Wednesday mornings, 10 a.m.-12 p.m, Sept. – June & Thursday nights, 6-9 p.m., April – November. Low Impact Excercise Class – Fall-Spring, Tuesdays & Thursdays 1:00 p.m. – 2:00 p.m.
Movie nights periodically throughout the year on weekend evenings. The Community Center periodically offers daytrips to events such as Yankee games, Bills games and more. Outdoor Jr. Lacrosse – Program for boys and girls grades 3 – 6. Program runs April – June. Kickball – program for children age 4 through current kindergartners. Program runs in May and June. The Spray Park will not be open to the public during the Summer Play Program on the following dates & times: July 5th – August 3rd, , Mondays through Thursdays, 9am -3pm. Summer Play Program – A free program offered to boys and girls grades K – 6 at the Community Center. Activities include sports, games, Arts/Crafts, field trips and fun! Trevor’s Gift Backpack program is available during our Summer Play Program. Food pickup is on Thursday afternoons. Reading Program for grades 3-6 (in the fall) is during the first 4 weeks of our Summer Play Program. Fall Jr. Soccer – Program is for boys and girls grades 1 – 6. Program runs August – October. Adult Coed Volleyball – Program for adults 18 and over (and must be out of high school). Program runs from November to April. Non-competitive league runs Wednesday nights & competitive league runs Thursday nights. Waterloo Community Youth Basketball – Basketball program offered to boys and girls in Grades 2 – 6 Program runs from November to February. Boys and Girl’s travel Basketball – Basketball program offered to boys in grades 3 – 8 Teams travel to various communities and participate in league and tournament play. Program starts in November and ends in March. Boys Rec Ball – Basketball program aimed towards those not fortunate enough to make a school basketball team. Program runs from December to February. Indoor Boys Lacrosse – This is an instructional program for grades 4 – 6. Pee wee Wrestling – Program for boys and, occasionally, girls ages 7 – 14. Program runs from December to April. Indoor Soccer League- For boys and girls grade 1-4.